17 Responses to Is conventional medicine based on good evidence? 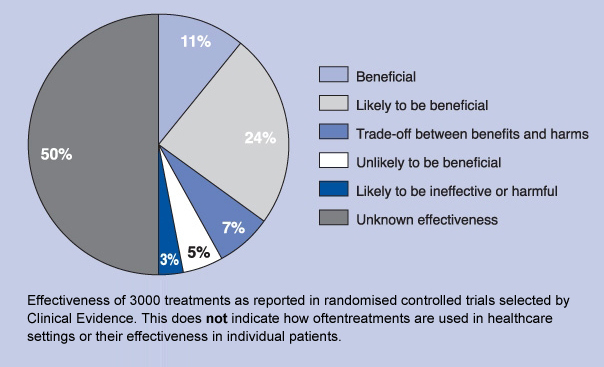 The chart shows 35% of treatments showing benefits in RCTs. 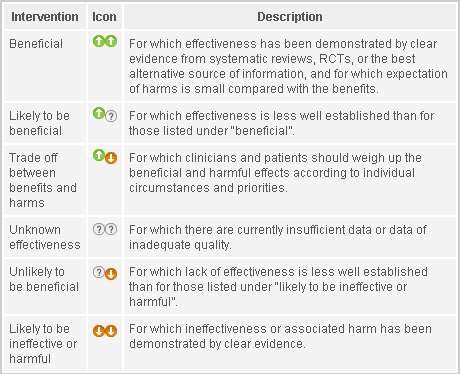 What relevance does that have to the question of the evidence base for treatments received in the NHS? If doctors base their decisions upon positive RCT evidence 30% of the time, that’s a fairly solid evidence base. If another 50% of GPs decisions, as appears to be indicated by Gill et al., are based on other forms of systematic clinical evidence (e.g. pragmatic trials) then general practice is fairly described as being evidence based. It would be good to have more information about the nature of the non-RCT evidence. What fascinates me in the above article (in the comment) is how ‘aggresive’ these people use these numbers and with a good measure of indignation. What they are saying is that “your rubbish doesn’t work, so how dare you question us’ – when I hear this argument doing the rounds then I know I am facing an Alternative medicine proponent, although they might claim to be Complementary. I guess the third category might include mainly cancer chemo therapeutics? Presumably the use of parachutes to prevent gravitation-related trauma would come under “unknown effectiveness”. It saddens me no end when I see CAM apologists using one of the great strengths of science-based medicine – its ability to be so self-critical in order to continue improving standards – as a blunt instrument to beat it with. They have a fundamental and lamentable misunderstanding of how science works. They see a graph like this and think ‘it’s all rubbish’ whereas when someone with an understanding of science sees it they will seek a true understanding of its implications and the meaning behind it, as Prof Ernst has done, and then roll their sleeves up and set about making it better. I will always try to see the best in people but I think anyone who sees this sort of statistic as a sign science-based medicine is ‘broken’ is beyond help. They are either incapable of or unwilling to understand their real meaning. And the bottom line is whether real medicine is good bad or indifferent it still doesn’t mean homeopathy, straight-chiropractic, acupuncture and the like are effective. Problem is that these people view disease and treatment in a completely different way. They have invented their own definitions, usually based on ‘ancient wisdom’, and EB medicine does not fall within their scope, and hence needs to be made suspect or even ‘destroyed’. Here is another example of how they view the world, very interesting but also very dangerous. These numbers are deceiving. If one chooses specific conditions the percentages are significantly different. For example, bacterial meningitis or even pneumonia in certain populations will have a much higher percentage with improvement than is shown on the graph after appropriate treatment, where if diagnosed or presented late or if the patient is immunocompromised the results will be lower. Hypertension in some settings is close to 100% improved with treatment as are many other conditions. Edzard you quote from your own 2004 paper Gill et al which was a paper published in 1996 in the BMJ(rather ironic) This data was from one training practice. I don’t think that this historic data from one practice can be used to help justify that GP’s currently use 81% treatments in their practices that show effectiveness demonstrated by clear evidence. Cherry picked data from some studies at single clinics in the mid 90’s gives a 80% figure that suits you Edzard. Who knows what the true figures were in the UK at the time? It may be higher now but you don’t know what the levels were 20 years ago. Thank you for bringing this up. Have read you article and must say it confirms what I said earlier. Of 3000 treatments conventinal as well as alternative only 330 can be termed beneficial by looking at the evidence. As stated earlier the beneficial group has shrunken over the years (from 17, to 13 to 11%). I understand your point that treatments used by conventinal doctors are/must be from the 35% group, but I cannot understand why this statement is not backed up by solid evidence. “A review of 74 clinical trials of antidepressants, for example, found that 37 of 38 positive studies were published. But of the thirty-six negative studies, thirty-three were either not published or published in a form that conveyed a positive outcome (Turner, 2008)”. read the post again; perhaps you overlooked the evidence I supplied? as to the ‘state of crisis’ – it relates mostly to poor quality trials; perhaps realising this made the % figures you quote decrease? is it therefore better to go with alt med? imagine you are in a burning house; you have 2 ladders to get out; one is far from perfect, the other one is awful with missing steps etc. ; which one would you take? The reason research cannot win pseudoscience is that researchers are used to critical thinking, mostly about their own work, also reporting their concerns. Pseudo-scientist sees a bit of correlation and believes he/she invented dihydrogen-monoxide. On an additional note, I would recommend to produce food cans with homeopathic conservatives. They can be shared with flat-earthers. The evidence you provided is hardly solid evidence. And as I have stated before. Most patients going to alternative treatments – which they pay for out of their own pockets – have already tried the far from perfect ladder – which are for free. What do you mean – for free?